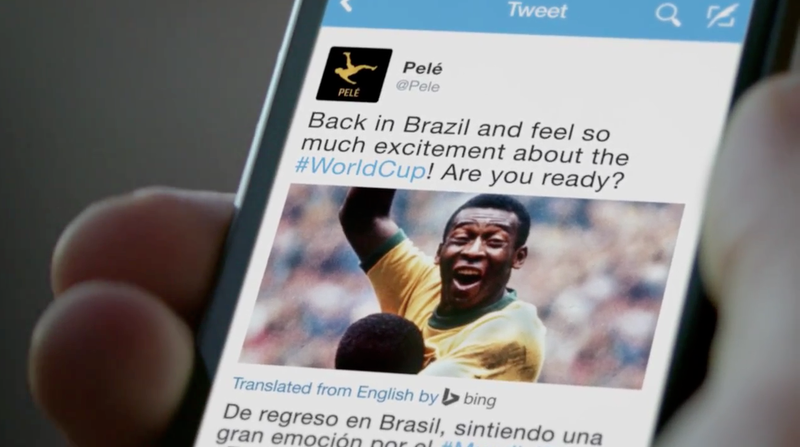 Twitter is doing plenty of digital activations around the World Cup, and now it's done a good old-fashioned video to get you pumped up as well. The spot, from Goodby, Silverstein & Partners, isn't creatively astounding, but it is well produced and does a nice job of reminding viewers to enhance their World Cup experience by connecting with friends—and their favorite players and teams—on Twitter. In the ad, this means lots of people staring at lots of phones, which is never a good look in commercials, but that's balanced out by some nice animation of cartoon Twitter birds exploding from every kick of a ball and every tap of a touchscreen. Throw in a tweet from Pelé, a couple of Vine videos and a Japanese girl taking a selfie, and you've got a pretty good overview of how Twitter will be used over the next month. The tagline is, "Love every second," which is actually quite perfect. Also cool (it's the little things) is the hashflags feature. Use a hashtag in front of the relevant three-letter country code, and that country's adorable little flag will appear after the text.